While a name plate is a common thing to see in a workplace, they are often needed for various reasons. From employee identification to the labeling of doors and stairways, name plates serve multiple functions in different places. Often when found in an office building, a name plate typically displays someone’s name and title. And these plates either sit on a desk or hang on a wall just outside of an office. But, many times these functional personal identification tools play different roles. Banks often use a name plate with a message such as Next Teller Please, Lane Closed and other instructions. Libraries can use name plates for labeling shelves and book carts so readers can easily find what they are looking for. And schools often use name plates for room numbers or door signs. Teachers may find it necessary to labels specific tasks or sections of a bulletin board. Name plates make this labeling quick and easy. 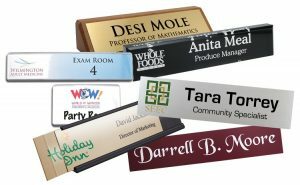 With simple adhesives or easy-to-use wall mounts, each name plate quickly becomes visible. Corporate gifting is one of the best ways to grow and maintain your business. Most companies agree that the fundamental reason for gifting is to acknowledge relationships and improve personal connections. 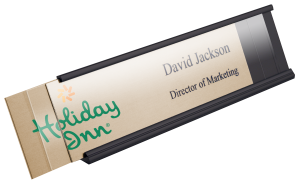 Customize each name plate with a person’s name and title or favorite saying and recognize them at your next meeting. Or, create a unique decorating style with a custom name plate with a favorite quote. Hang them with wall mounts or set them on a shelf or counter with either a desk holder or desk base. And, choose from a variety of colors and printing or engraving options to customize the look. Name plates make unique awards. Use award titles and other achievements for the text on name plates. Everyone is sure to enjoy this unusual name plate use. In many offices and workplaces, information about rooms or directions is a frequent need. Customize name plates to meet any informational needs and help visitors and employees feel more welcome. Whether it is to point out a meeting room or a restroom, these directions are often required in most settings. 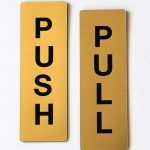 We’ve all seen the push or pull signs on doors. Use a name plate to designate which way a door swings, so people know without having to try both ways. No matter your use for name plates, we’re sure to have what you need! While name plates are common in most workplaces, we all need them for different reasons. And, many of us have a desk or cubicle at work, so it’s easy to display that coveted piece of personal identification. And while most name plates have a name and title, some are used for other reasons around the office. Name plates easily sit on a corner or small portion of your desk. Use a traditional metal desk holder for your plastic or metal engraved name plate. These sit conveniently on the corner of any desk so that they are visible to passersby. Another option is to choose an acrylic desk block or executive desk wedge. These options, while a little less traditional, actually offer an upgrade to your name plate look. Another option for a desk top is the plastic desk base. This classy item fits most designs and still allow the nameplate to sit on the corner of your desk comfortably. Or, be a little less traditional and set it on your computer monitor or tower. Attach a name plate to the front of a desk. Using either a wall mount or adhesive, attach the plate on the front of your desk. This idea is perfect for the current trend of standing desks. That way, no matter the height of your desk, your name plate will always be visible. Choose from Velcro, magnets or double-sided tape to accomplish this simple, yet effective presentation. Using an adhesive also enables you to attach name plates to other objects on or near your desk. Use the double-sided tape to mount the plate to stacking desk trays or a white board. Mount the plate on a wall or door of your office or cubicle. From Contemporary Name Plates to traditional engraved name plates, one of the most popular ways to display room names and numbers and directions is to hang them on the wall. Accomplish this easily by using a wall mount or an adhesive. We also offer partition pins to hang your plate on the side of your cubicle conveniently. Maybe you need to label a section of a wall for different types of forms? Simply attach this useful item next to the section, and just like that you’re done! And everyone in the office can see what they need and how easy it is to get it. What creative way do you display your name plate? Do you have yours hanging from the ceiling? Maybe it’s secured to your desk in a different way. Or is it in the hallway outside your office? We want to hear how you have your name plate displayed! Defining our business helps our customers to fully understand what we do. While our FAQ pages are full of your questions, we thought we’d get down to the nitty-gritty for you. Here is part two of our definition series so, find out more about how our business runs with these great definitions for some of our products! 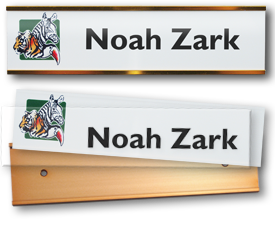 A name plate holder will display your name plates on walls, cubicles or desks. Most people simply refer to these products as holders, brackets or sliders. However, none of these terms fully describes the products we offer. A simple way to clear up what you need is to answer the question of where you are putting the name plate. These simple, curved-style holders will display a name plate on a desk or other flat, horizontal surface. 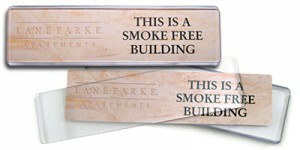 A name plate slides easily into the holder and can be changed as needed. Attach or mount these flat-style holders to a wall or door to display your name plate. By using adhesive or nails/screws, these holders are easy to install. And, your name plate slides into the holder just as easily as a desk holder. 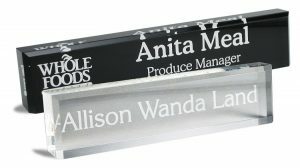 This clear, plastic holder displays your name plate on your cubicle wall or over a door. The name plate holds in place by the pressure of the flap or can attach to the plastic flap with double-sided tape for a more finished look. 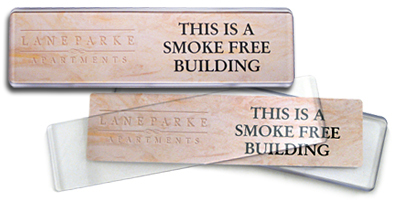 With a slanted opening in these flat-style holders, your name plate will stand upright for easy viewing. These are commonly used on desks or other flat, horizontal surfaces. Do-it-yourself (DIY) options are all the rage these days! And what better way to do this than with a reusable name plate system. This system consists of four parts: a name plate holder, a metal back plate, a clear printable insert, and a Lexan lens. The metal back plate is engraved with your company or personal logo to identify your brand and unify your name plates in an office or professional setting. The printable insert is clear so as to show the back plate under the printed name. And, the lens slides over the top of everything to keep it all together and give it all a professional, finished look. 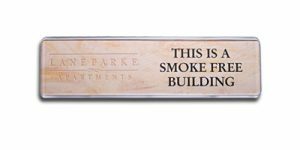 Designed to complement any decor these name plates are the perfect solution for an office or reception area. This system also consists of four parts: an attachment, a back plate, a printable insert, and a clear lens. These contemporary name plates work much like the reusable name plate system and are just as easy to use. The benefit to the contemporary system is that it comes with interchangeable back attachments. Choose from a wall attachment, a cubicle stand, or a desk stand. Do you have any further questions about these definitions or the products to which they pertain? There will be more articles coming with even more definitions! Please help us by letting us know what definitions you need. Are there specific things you just don’t quite understand? Reply with anything that you might need help with!